﻿D3 Evaluate how selected retailers have met their social, ethical, and environmental and co-operate social responsibilities This report will evaluate how selected retailers have met their social, ethical, and environmental and co-operate social responsibilities with Tesco plc and the co-operatives. Social Vicky redwood, chief UK economist, capital economics say?s ?health, DIY and home maintenance which attract a large share of elderly households? budgets? 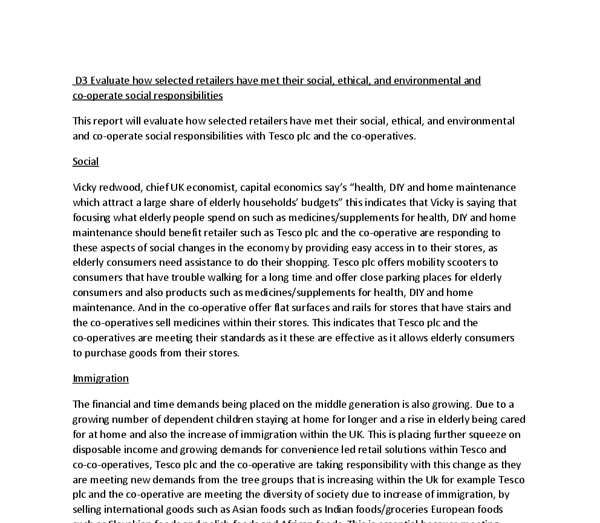 this indicates that Vicky is saying that focusing what elderly people spend on such as medicines/supplements for health, DIY and home maintenance should benefit retailer such as Tesco plc and the co-operative are responding to these aspects of social changes in the economy by providing easy access in to their stores, as elderly consumers need assistance to do their shopping. Tesco plc offers mobility scooters to consumers that have trouble walking for a long time and offer close parking places for elderly consumers and also products such as medicines/supplements for health, DIY and home maintenance. And in the co-operative offer flat surfaces and rails for stores that have stairs and the co-operatives sell medicines within their stores. This indicates that Tesco plc and the co-operatives are meeting their standards as it these are effective as it allows elderly consumers to purchase goods from their stores. ...read more. rails and air journeys) greenhouse gas emissions. The Co-operative Funeral care became the first carbon neutral funeral director in 2011, and The Co-operative Pharmacy became carbon neutral in 2012.In addition, for every eco-insurance policy sold by The Co-operative insurance half a tonne carbon dioxide is offset. Corporate social responsibilities Local community- in the 21st year of the ‘Tesco for Schools’ and Clubs voucher scheme, Tesco have donated over £185 million worth of equipment to local schools in different community. This year a group of young people won a competition to join a youth board and advised us on how to improve our stores for children. * Community Donation Cards-Each store has a community donation card with budget to donate raffle prizes and refreshments to local community groups. * Local Charity Collections-We allow local and national charities to hold collections in our stores. From January to November, these are booked in by LIME for Superstores and Extras. Metro stores manage their own charity calendar. Collections in December are arranged at store level. * Community Champions-Many of our stores have a dedicated Community Champion to coordinate community and charity activity on behalf of their store. All guidelines for supporting local communities at your store are available in the Tesco Operating Manual. ...read more. Informed choice-Tesco plc and the co-operative offer clear information on their product so that customers get an indication of what?s inside the product. This is improved in the both stores as they give clear information about the product. Special ranges- Tesco plc and the co-operative offer special ranges of food products for different types of consumer; For example consumers that want product that are low calories, product that don?t have dairy in it. This indicates that Tesco plc and the co-operative are meeting the demands of providing special ranges for those types of consumers that want it. Responding to current trends- Tesco plc and the co-operative are responding to new trends in the market. For Example, Tesco plc and the co-operative respond to trends by adapting to societies new demands by refurbishing their store by making the stores more modern, is providing more exotic foods from different countries, having more worldwide foods in their store. In conclusion, the two retailers have met their social ethical, environmental and corporate social responsibilities in the market. The two retailers have done this by meeting the demands of their consumer, always making improvements within their stores and adapting to the markets. ...read more. customers and offer the best possible service to them in order to gain their continued custom. Tesco has a very powerful tool when it comes to the customer trends, their loyalty card. Tesco's loyalty card programme is the largest in the UK with millions of users worldwide and this tool allows them to monitor customer trends. Besides the Porter's five forces analysis, a PESTEL analysis is necessary for the success of McDonald's. 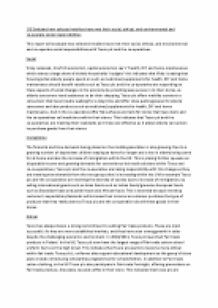 PESTEL is an analysis of the external macro and micro environment in which a business operates. PESTEL stands for political, economical, social, technological, environmental and legal factors. However, even as rival IT companies and a host of other recruiters vie with Infosys over the recruitment of the fresh, inexpensive engineering talent, there is little that these corporates have done to aid in the recognition and reward of top Indian research. Also those who have specialist diets will be those from the high affluence category where they are purchasing the high end quality products which are included in their diet and will look for products which have low calories and less chemicals in order to help their specialist diet to progress. Personal Hygiene Tesco are impacted by personal hygiene as they must make sure that they abide by the procedures, which are mentioned before, when it comes to personal hygiene. For example Tesco must guarantee that in their bakery the employees wear hair nets especially those who prepare the bread to ensure that no hair goes in the bread. They will also focus on education as seen on adverts they already sell school uniform for children that are a certain age which is mostly primary school. They will also sell school equipment for all ages from primary to secondary and even to college. This opens a whole new market.